The Petty family made a new for themselves driving Mopars. Richard Petty dominated NASCAR tracks in the '60's and '70's driving Plymouths and Dodges. But, Chrysler pulled the plug in '75. In the face of dwindling factory support, Richard Petty made a drastic change switching to GM products during the '76 NASCAR season. That switch would last into the late '90's but most people associate the Petty name with Mopar race cars. A few years before Chrysler announced they would be getting back into stock car racing I was inspired to build this fantasy '99 Chrysler Concorde Petty stock car after Ertl came out with their 1/25th scale Chrysler Concord "slammer" model. The Chrysler Concorde had a very swoopy shape and I thought it would make a cool looking nascar. I also thought it would be neat to see the Petty family back in a Chrysler product. 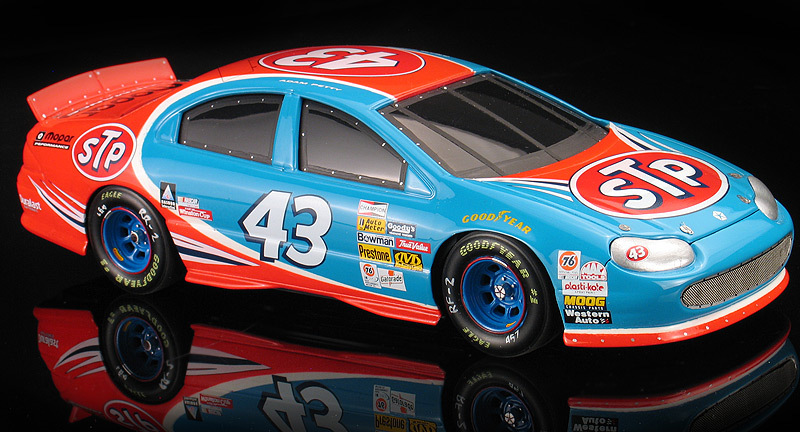 Adam Petty was an up-and-coming young driver in the Busch Series and I envisioned him one day moving up to NASCAR and racing with his grandfather's famous #43 in this Chrysler. To convert the stock Amt/Ertl Concord body into a NASCAR body, I smoothed over the body seems and marker lights. I also added a scratch-built rear spoiler, a wire mesh grill, and NASCAR wheels and tires from my parts box. 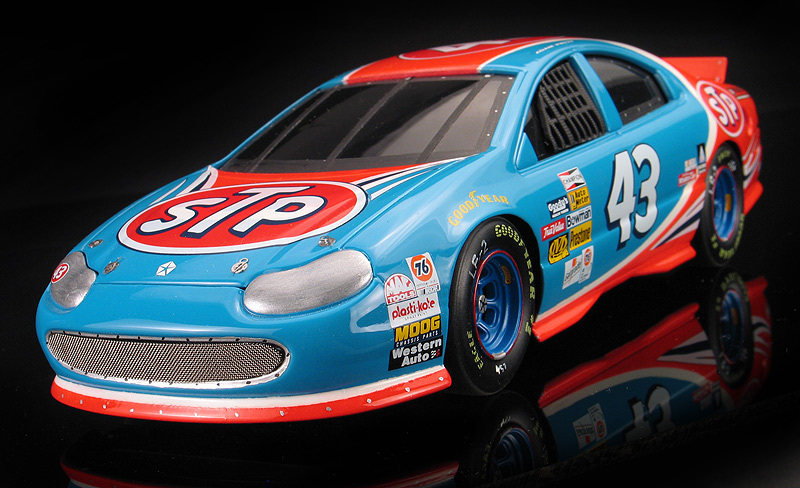 I designed my own fictional paint scheme by using a set of slixx decals from Richard Petty's '97 Pontiac stock car and repositioning the patterns to better match the Chrysler Concord's body work. I also created a set of custom made dry transfers for the Mopar Parts graphics on the trunk and quarter panels. I also added photo-etched hood pins for extra realism. <y model is a simple "slam" model so there is no interior, chassis or engine detail. 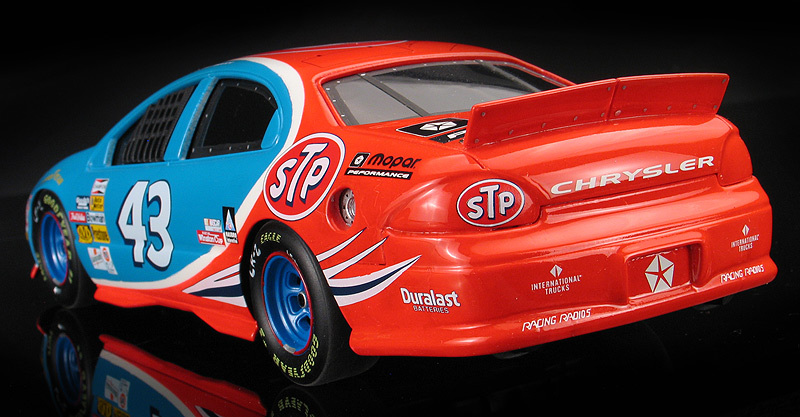 To my surprise, in 2001 Chrysler did announce they would be returning to NASCAR but instead of the Chrysler Concorde they decided to use the Dodge Intrepid body. 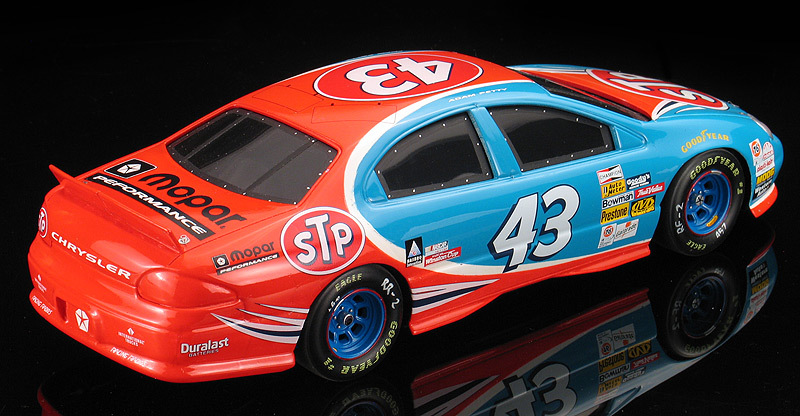 Unfortunately, Adam Petty was also tragically killed in a racing accident so the dream of this Chrysler actually seeing a track in real life remains unfulfilled.